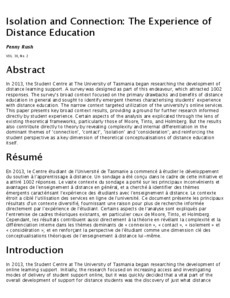 In 2013, the Student Centre at The University of Tasmania began researching the development of distance learning support. A survey was designed as part of this endeavour, which attracted 1002 responses. The survey’s broad context focused on the primary drawbacks and benefits of distance education in general and sought to identify emergent themes characterising students’ experience with distance education. The narrow context targeted utilization of the university’s online services. This paper presents key broad context results, providing a ground for further research informed directly by student experience. Certain aspects of the analysis are explicated through the lens of existing theoretical frameworks, particularly those of Moore, Tinto, and Holmberg. But the results also contribute directly to theory by revealing complexity and internal differentiation in the dominant themes of ‘connection’, ‘contact’, ‘isolation’ and ‘consideration’; and reinforcing the student perspective as a key dimension of theoretical conceptualisations of distance education itself.